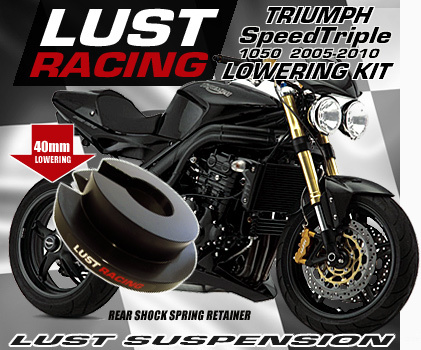 Lowering kit for Triumph Speed Triple 1050 year models 2005-2010. This lowering kit lowers the seat height 40mm (1.6"in) by lowering of the rear suspension. This kit uses a new spring retainer for the rear shock absorber unlike our lowering kits for later 2010-2015 Speed Triple 1050 models that uses suspension linkage brackets. By replacing the OEM rear shock spring retainer with a new one, the length of spring in relation to the the shock absorber compression is increased. Thus the shock compresses further under the equal load compared to the standard bike. As a result the bike's seat height reduced by approximately 40mm or 1.6" inches. This kit uses a spring retainer due to the construction of the suspension linkage on the earlier Triumph Speed Triple 1050 year models 2005-2010 which would make a conventional lowering kit replacing parts in the linkage a rather expensive solution. This kit is as such not difficult to install for the one who has gained experience working on their bike but it will require some special tools and caution while working; For work safety a motorcycle a shock absorber spring compressor must be used compressors during de-assembly of the standard spring locking plates and removal of the standard spring retainer - as well as when installing the new Lust Racing spring retainer/lowering kit. Installation of this kit will require that the rear shock absorber is removed from the bike so that the standard spring retainer can be removed from the shock absorber. The bike will need to be supported under engine/frame during this job. If you do not have the required professional tools and don't want to invest in them, leave the installation of this kit to a professional - your local Triumph brand dealership or well equipped motorcycle garage. If you are a beginning home mechanic or have little experience we recommend leaving the installation to experienced mechanics used to work with motorcycle suspension / shock-absorbers. We supply the kit with a detailed installation instruction. The new lowering spring retainer in this lowering kit is machined from high grade aerospace aluminum. Color black with Lust Racing logo in red and sliver-chrome. When installed the seat height is reduced by approximately 40mm (1.6" inches) from standard height (depending on shock settings and spring condition). This lowering kit will fit Triumph Speed Triple 1050 models manufactured 2005, 2006, 2007, 2008, 2009 and 2010 (serial numbers up to 461331). Sprint retainer material: CNC machined high grade aerospace aluminum. Black anodized with Lust Racing logo in red and silver-chrome. Made in the UK by Lust Racing - Europe's leading manufacturer of high quality motorcycle lowering kits. To keep the handling of the bike neutral the front forks are lowered by moving the front forks upwards in the triple clamps, this is an adjustment only - no additional parts required. Fitting this lowering kit will increase high speed stability, lower the center of gravity and improve rear wheel traction (grip) and indeed reduce the seat height. High quality aftermarket accessory made in UK for Triumph Speed Triple 1050 2005-2010, recommended for shorter riders.